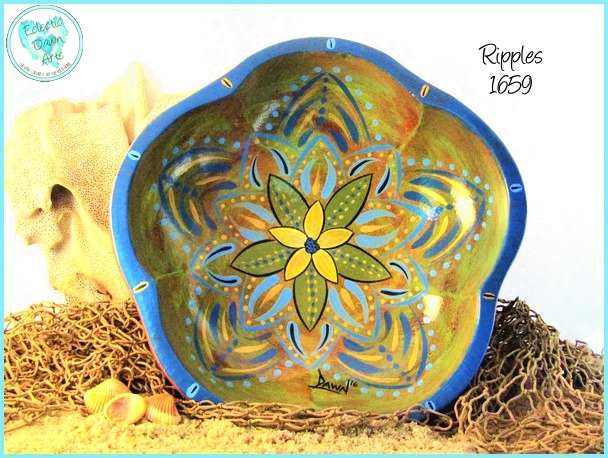 'Ripples' (accessories not included), TB1659, ~10 inch flower shape bowl. 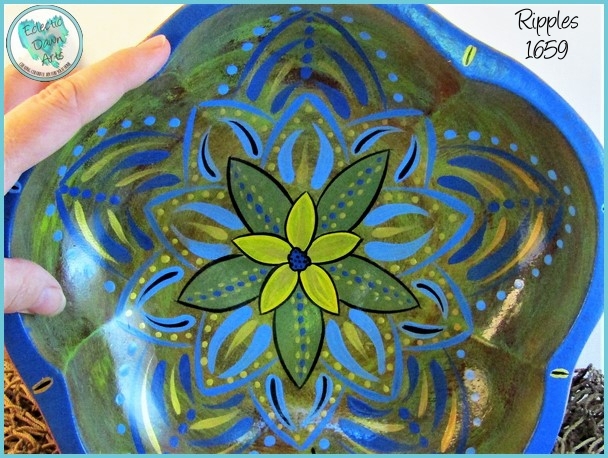 Hold the zen magic of a rippling pond in your hands. This sizable piece shows a stylized yellow water lily floating on the water, ripples moving toward the edge of the bowl. This is a statement piece, unique in style. Free shipping. Not food safe, clean with damp cloth, do not put in dishwasher. 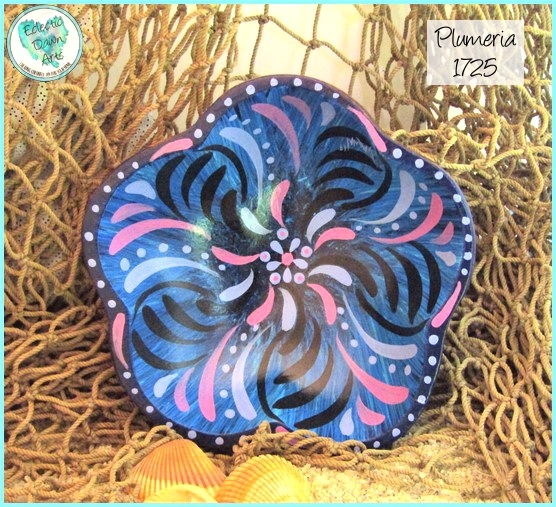 #TB1725 : 'Plumeria' decorative bowl in blue, purple, black abstract design (accessories not included). ~4.5 inch flower shape (sizes are approximate due to the organic shapes). A modern take on one of the Hawaiian flowers used to make a lei, the plumeria or frangipani flower in shown here in an energetic spiral. 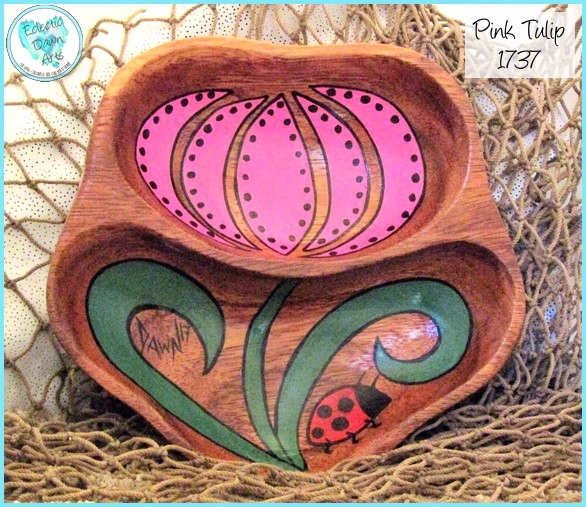 A splash of energetic color for your home, a place to keep your rings, or a one of a kind gift for someone special - perhaps a friend who loves to garden. 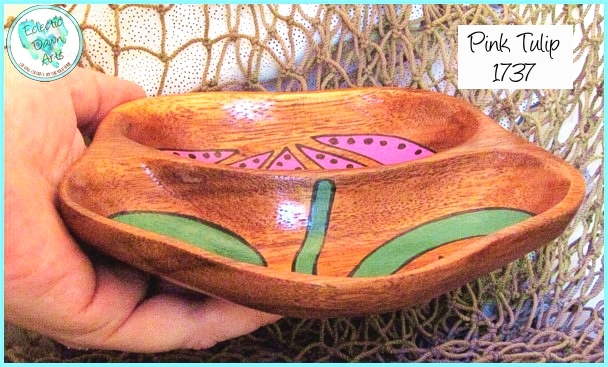 This piece would look great in your tiki bar, too! Free shipping. Not food safe, clean with damp cloth, do not put in dishwasher. 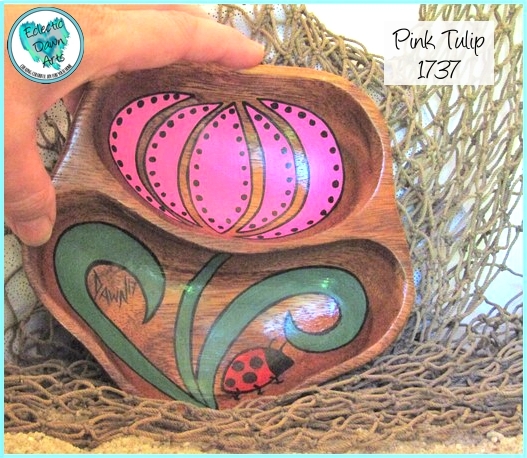 #TB1737 : 'Pink Tulip' Trinket Tray (accessories not included), approx. 6 inch ht x 6.5 inch w. Nothing says SPRING like tulips and ladybugs! You can have spring year-round on your desk or on an end table with this unique and whimsical piece. A fantastic gift for the gardener in your family. A place to keep rings and tiny things. Free shipping. Not food safe, clean with damp cloth, do not put in dishwasher.